Since 2005, Arsenal has only won one trophy, last season’s FA Cup. Wenger has long been accused of not investing in the club while his supporters argued that his austerity was necessary to finance the new stadium and other infrastructure projects. This has changed, however, in the last two years: 102 and 52 million euro were spent, which caused a deficit of about 130 million euro in the transfer market; therefore, they achieved much less than in previous years and spent a lot more money. These problems have not gone away. Last season they only ended up in fourth place thanks to a great run at the end of the season (winning their last five and Everton dropping nine points). They may catch up to Manchester City and Southampton by the end of the first half of the season, yet the problems still show, especially in Europe. Furthermore, they’re currently benefitting from the instability in the Premier League, e.g. Liverpool’s crisis, the aftermath of the Moyes era at Manchester United, and Everton’s vulnerability. West Ham and Swansea are Arsenal’s closest pursuers; West Ham even has the same point total and an only marginally lower goal difference. Wenger’s critics have not grown quieter this season. The reasons are obvious and have been for years. This article will analyse these criticisms and take a closer look. Although big transfers were made for high-class players, there was a lack of an understandable rationale for the players purchased. The positions they would occupy in the squad were understandable but they were often not the perfect complement to their teammates. 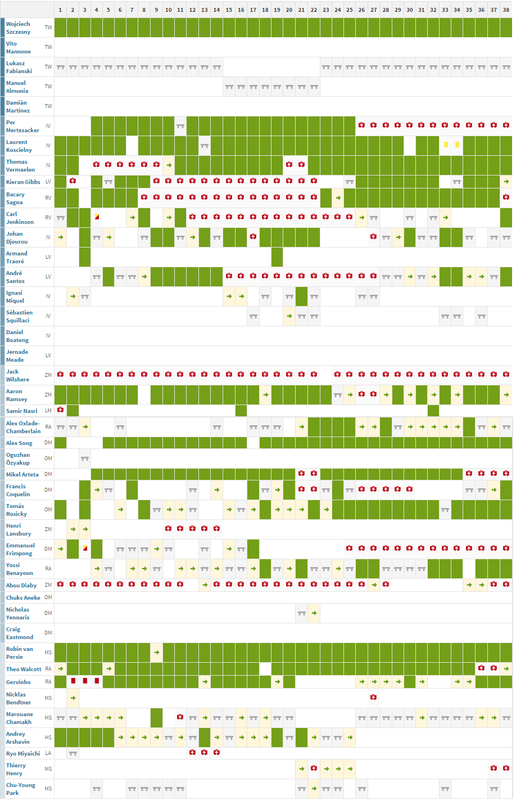 In a chronological analysis of the transfer activity in recent years, many minor errors catch the eye. It all begins in the 2011/12 transfer window. Three extremely important players left Arsenal that summer: the underrated left-back Gael Glichy, superstar playmaker Cesc Fabregas, and the creative all-rounder Samir Nasri. All were replaced in principle; but the types of players that replaced them were almost polar opposites. Oxlade-Chamberlain was expected to be Nasri’s replacement, but is a more powerful and wide-ranging player, who is defined by his tremendous dribbling skills and his movement. To that end he moves out of the wings very diagonally, as Nasri did. This allows him to come into the middle from the sides and flexibly overload zones, where he is very present and intelligent in tight spaces, and plays outstanding passes to the strikers. Arteta was a similar case. He was probably meant to fill the gaping hole in the midfield left by Cesc. Arteta, however, is somewhat “sluggish” in his decision-marking, struggles to create a big impact and cover a lot of space with his passes, is not as vertical, and plays a little deeper. This also disrupts the balance in the fundamentally important middle of the pitch, although Arteta is a very good footballer. Only Eboue was ideally replaced (in theory), as the young Jenkinson came in to replace the overaged right-back. The squad additions were either simply poor (Andre Santos replacing Clichy; Chu-Young Park) or did not allow time and tactics for proper integration (Gervinho). This theme continued the following season. The next season, Wenger seemed to react to the criticism that Arsenal played on a small scale and were not vertical enough. After Fabregas and Nasri left, the Frenchman did not seem to want to purchase these types of players in midfield and wished to control the wings with a different attacking style. But, he didn’t seem to understand how these players fit together or how to integrate the new additions. Olivier Giroud was purchased for his goal scoring success in Ligue 1 and his physical presence on high crosses and long balls. He was probably seen as a counterpoint to the frequent short passing combinations in the middle of the field. But, Giroud was defined more by his movement on quick layoffs and low, drilled crosses into the less-occupied penalty area. His space opening runs, however, were barely integrated due to the lack of verticality from central midfield and the wings. Thus, there were fewer low crosses played in for him and he also missed several chances. Lukas Podolski should have provided a goal threat by cutting in from the left with his strong shot but was significantly weaker than his predecessor in combinations and build-up play and displayed problems in his defensive play as well as his tactical movement. In some games he was able to produce his penetrating power but he was especially weak against compact opponents. Only Santi Cazorla seemed to be a suitable purchase in this transfer window; he is strong in combinations and tactically intelligent. Despite his propensity for short passes he can provide threatening vertical passes or good dribbling in tight situations. Nacho Monreal’s purchase in the winter was also not bad, even if he was a bit too expensive for his quality. Nevertheless, there were still some departing players that were not replaced. Alex Song, as a defensive eight, was a generally vertical player, pushing up with and getting in behind the action in addition to playing as a protective six. No other player could compensate for his flexibility. The exit of Robin van Persie, whose technical strength, combined with his intelligence and outstanding finishing, could not be adequately replaced by Giroud and Podolski. His departure was just as important as the loss of Cesc in the previous season, who they still hadn’t replaced. The same thing would happen the next season. Yaya Sanogo was brought in as a striker; but despite his great talent he had similar problems to Giroud and is also (still) not good enough to help immediately. Mathieu Flamini falls into the category of a safe transfer; on paper he is actually a very good option. He is of sufficient quality for the bench, despite a difficult time at AC Milan, has Premier League experience, is familiar with the environment at Arsenal, and can be used as a technically sound destroyer. But, he often has problems in quick, complex games; his ball distribution is not clean enough, he makes mistakes when he pushes up, and can’t stabilize the midfield. Arteta has similar issues, leaving Arsenal without the right kind of players in the vital six position in dynamic games or against compact opponents. The short loan spell of Kim Källström would not provide any help. 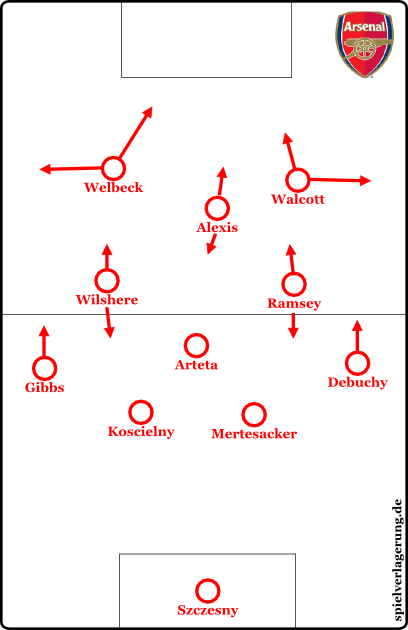 Because of Arteta’s lack of verticality and Flamini’s technical and strategic deficiencies, both players must hand over those tasks to others; Jack Wilshere and Aaron Ramsey, as the eight in a 4-1-4-1 or the ten in a 4-2-3-1 must often drop back and play deeper. This robs them of presence up front. Mesut Özil was also purchased that summer to compensate for this. For 50 million euro, in came a player who was not accustomed to this load and mastering such a broad area of the pitch. Although Özil is a ten, he isn’t a playmaker in the literal sense. There were some games where he dropped back out of the central attack for buildup but then focused on making simple passes; he does not possess the strategic vein of a Xavi as he lacks the knowledge of the effects of certain shapes, positional movements, and the impact of certain passes in the six space. He is, however, outstanding in open space in the final third, at combining with direct flick-ons, receiving difficult to control balls, and playing killer passes. This was often not how he was used; Özil’s signing displaced Cazorla to the left side, while Walcott, when fit, was on the right and Giroud up front. As a result, it was Walcott, who was actually almost the only really suitable support for Özil, that made the runs for his passes and attacked the spaces he opened behind him. Cazorla, however, overloaded the middle, which gave them a greater presence there but also made them easier to isolate. 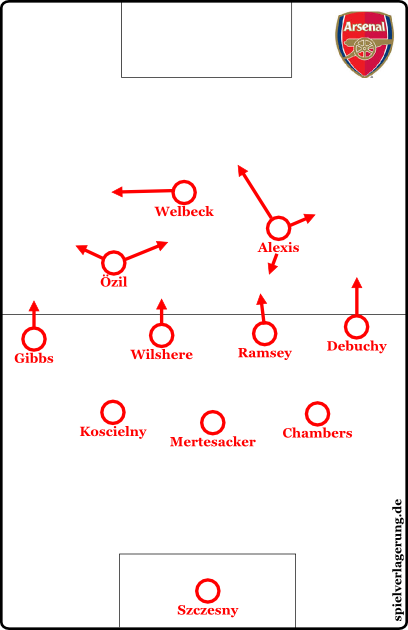 Wilshere also often played in this role as an indenting outside-left. The departures of Gervinho and Arshavin in the same transfer window (Summer 2013) were also negative, although Arshavin could not reap the benefits of his first season. Chamakh, Santos, and Denilson Neves also left, but they were barely even missed on the field. What hurt most was Giroud’s injury; in many games three or four of Özil, Rosicky, Cazorla, Wilshere and Ramsey played in midfield behind Giroud, with either Flamini or Arteta as the six. Ball control, yes. 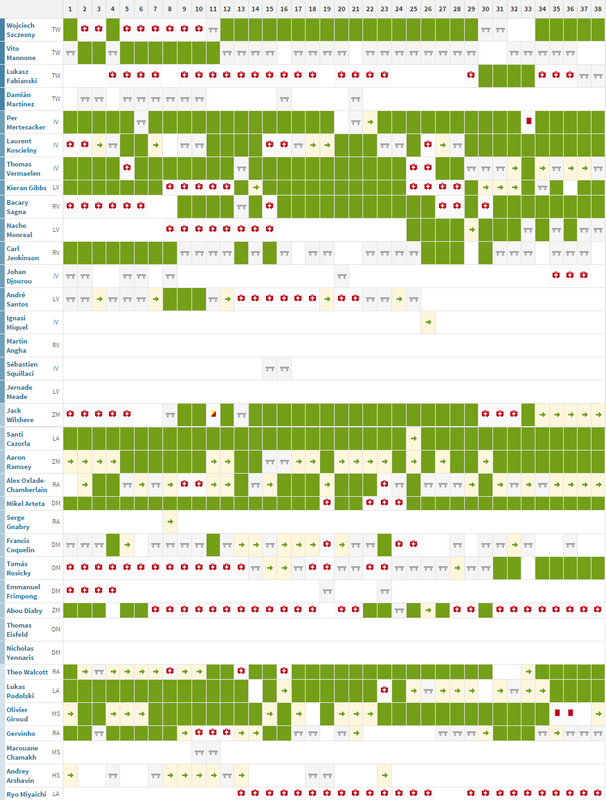 Game control, no (despite them frequently alternating between 4-1-4-1- and 4-2-3-1 and varying their positions). Therefore, further additions were sought this summer. To begin with, however, neither a high-class six nor a playmaking, defensively stabilizing eight were bought. 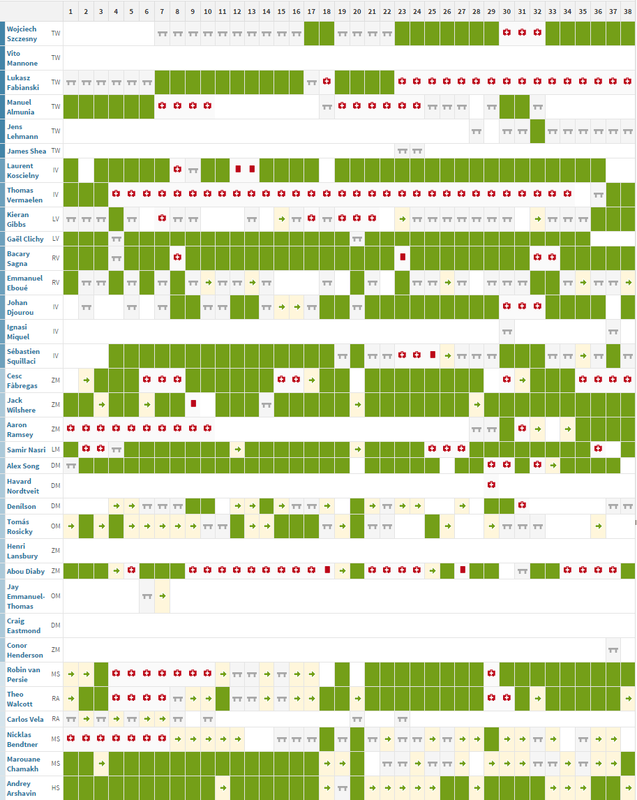 Two of the many problem areas were not fixed, although this is understandable to an extent. With Jack Wilshere and Aaron Ramsey, Arsenal have two very young and highly talented players in the center of the pitch. Nevertheless, they do not complement either Flamini or Arteta; this leaves no strategically complete build-up player at six, which forces Wilshere and Ramsey into this task, diminishing Wilshere’s skills as a dynamic needle player and Ramsey’s goal threat. They cannot solve these problems. Wenger often tried this combination in the center, with Özil often played as a left winger; this left Arsenal’s system without a strategic guide, an inadequate occupation of the wings, defensive problems, counterproductive roles for the team, and an extremely thankless task for Özil. Again, Wenger purchased a very good player but used him suboptimally. The Frenchman’s purchases on defense and offense this season, however, were very good. Calum Chambers is a talented defensive all-rounder who can play as either a center back or full-back. Mathieu Debuchy is a more offensive-minded right back and the two compensate well for the departure of Thomas Vermaelen to FC Barcelona, although, as a left-footer Vermaelen occupied the other side of the field. On offense, the two all-rounders brought in were Danny Welbeck and Alexis Sanchez, with Sanchez playing as a right winger and Welbeck as a center forward. While this is certainly not ideal for Arsenal’s rhythm, Sanchez is world-class and Welbeck is a very complete player. The problem is the occupation of the center and integrating both players; on the left, Özil is too far out of sight of Welbeck’s runs and Sanchez’s positions, the inadequate selection of Ramsey and Wilshere impedes the center a bit, while the problems at the six position still exist. The defense is relatively stable, although the wing defense (in particular with Gibbs/Monreal on the left behind Özil) is somewhat vulnerable and there are tactical problems on defense with their compactness and the harmony of their pressing movements. A major problem, however, is that many strong players in the squad are often injured and, as a result, Wenger’s tactical choices become limited. This article is mainly focused on tactics – but injuries are a huge aspect that is often overlooked. Injuries limit the tactical variations. If half the team is missing then a manager is forced to go with certain types of players and his ability to customize his game plan against an opponent will be compromised. Injuries also hinder the player’s time with the team. If the team play often with one another in practice then they get to know each other better. Sequences become more automatic, the routes players run better complement their teammates, and the team plays in total harmony. But what does Arsene Wenger have to with this? Injuries are usually attributed to “bad luck”; this is often the case. Serious leg fractures from ‘rustic’ tackles can’t be attributed to the manager and injuries often happen in private faux pas. However, it is scientifically proven that managers are responsible for certain injury patterns, these include the “takeaway” of players or coaches switching clubs and lots of injuries to their players (especially of muscular nature and ligament injuries.) Doctor Jan Ekstrand, Professor of Sports Medicine and VP of UEFA’s medical committee has proven this in his many studies and is also responsible for the UEFA medical report. Wenger’s injury crisis over the last five years is startling. The likely causes for this crisis are overworking the players, a lack of rotation, long training sessions and training that isn’t football-specific. That Wenger recently fired his former athletic trainer and hired an expert from American Football as his replacement speaks volumes. Because non-specific conditioning does not train the right muscle groups, many aspects, like abrupt movements, twists, the mixture of physical and mental stress, and the interaction of complex processes inside the athletes are ignored. All of which leads to fatigue, which causes injuries; the expertise of these fitness coaches is also not applicable to football because football has completely different requirements. The statistics speak against Wenger and his training methods for years. The proportion of injuries to all players is enormous, and also “impressive” even if you take out all of the players who didn’t play any games. This is probably a reason for one of Wenger’s biggest problems in the previous seasons; the weak pressing. The injuries not only ensure less time on the training ground, less time together with their teammates, but also a reduction of Wenger’s required intensity. Rumor has it that Alexis Sanchez has pressed less recently so that he won’t be fatigued and, as a result, injured; although muscle and overuse injuries tend to happen because of incorrect training and overworking before the game. Whether the rumor is true or not, it is clear that the injuries have had a psychological impact on Arsenal’s tactics. In analyzing Arsenal’s games, it is clear to see that their pressing intensity and their formation drops against teams like Dortmund, Bayern, Real, and other top clubs. Their movement on attack is not as great; the strikers don’t direct the opponent’s build-up play well and there seems to be no complex movements or tactical mechanisms. At Guardiola’s Barcelona, the prime example of a physically inferior, but aggressive and intense team, you could clearly see the reasons for the eight in the 4-3-3 (or 4-1-4-1) pressing and how exactly he approached and pressed the opponent. There were numerous, well-rehearsed triggers for their pressing. Arsenal’s pressing looks more improvised. The strikers either don’t start pressing or do it alone, the rest of the team must then follow suit, but they either do it too slowly or not at all. If it doesn’t happen quickly enough, then the opponent can outplay the first pressing line and have space and time as the second line runs toward him. This time and space allows him to play passes against the direction of their runs, easily gaining space and generating quick attacks behind Arsenal’s defense. If the other players follow the lead of the strikers and don’t press, the attackers can very easily be overlooked. This allows the opponent to build up on a higher level in peace, circulate the ball, and advance further upfield. As a result, Arsenal’s pressing has declined in recent years. In the past two seasons, they set up in most games with a slightly deeper defense, an improved central presence as well as a more stable defense in the penalty area. They have also allowed fewer goals thanks to having more possession, which suggests stability, however, without strong pressing they are still defensively vulnerable against the high level teams. There appears to be no clear guideline, especially after turnovers. Some players stop, others rush back and others seek to slow down the opponent’s counter-attack with aggressive gegen- or counterpressing. The latter is often attempted but doesn’t work for many reasons. One reason being the distances within the formation and to the opponent, which don’t prepare the pressing well, provide for defensive instability in midfield, and also create the transitions. A particularly serious problem for Arsenal, particularly on the international stage, is their lack of compactness in their work against the ball. They especially lack horizontal compactness on ball-oriented shifts to the wings, where they don’t pressure the ball-carrier as much. The lack of compactness prevents them covering the attacking winger and full-back, as the central players must protect the middle, while the far-side players are usually far away from the ball. As a result, the central players can not go after the ball-carrier and support the wide players which leads to a low rate of success. The distances in the center of the field are also greater than they would be if the far players indented. This allows the opponent to either combine through these gaps more successfully or switch sides and play forward into the open spaces and circulate the ball with less pressure. Their vertical compactness is also often poor. At times they have up to twenty meters distance between their lines; in addition to reduced intensity and access when pressing this causes problems after they win the ball. 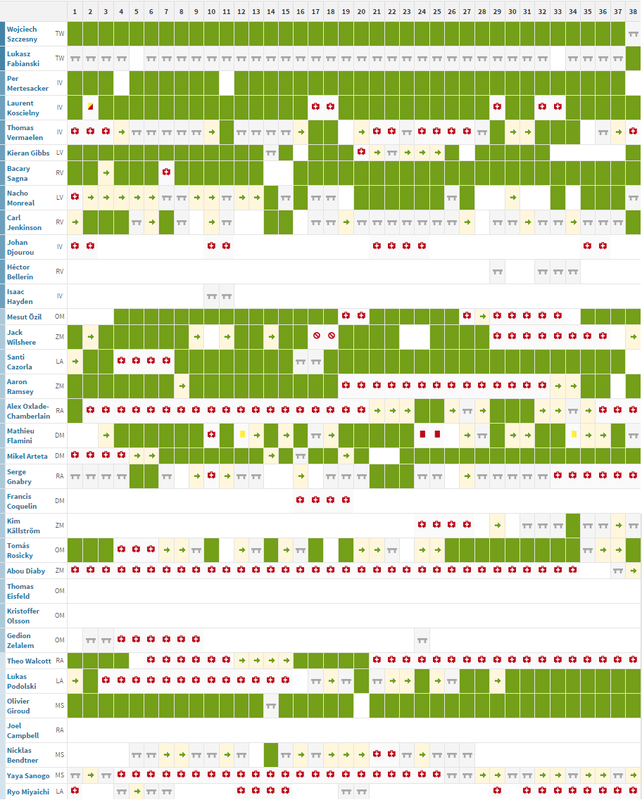 Fast counters are practically impossible because the players are too far apart. By the time a passing option is found and the ball is passed, the opponent can, with good gegenpressing, as BVB and Bayern have repeatedly demonstrated against Arsenal in the past three years, quickly prevent counter attack chances. But it’s not only in these situations that the distances for Arsenal are suboptimal. In their build-up play, the distances between the players as well as their fields of view and passing options are often poorly organized. The six often stands too close to the center back, without really dropping between them; even if he does, the center backs don’t fan out wide enough, so they don’t occupy space optimally. The opponent can more easily defend as there are fewer passing angles and opportunities available and the other Arsenal players have a harder time getting open. The fullbacks cannot advance further forward, the wingers must then give more width or (if indented) they are effectively taken out of the game. The eights or the two sixes and the ten (depending on the shape and the roles in midfield) must continuously drop further back to offer themselves as options for the center backs and six. The zones on the pitch are not properly occupied. 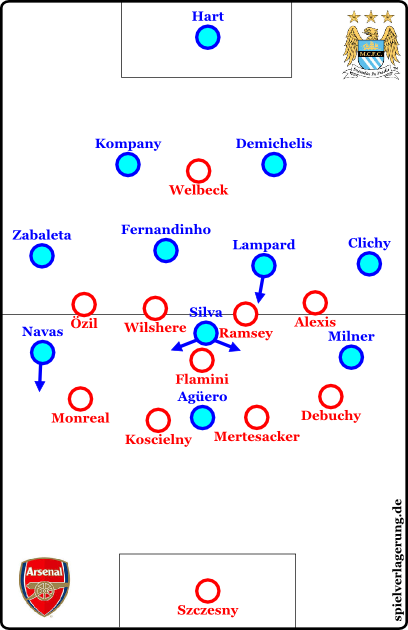 The opponent must only defend certain zones and pass patterns to prevent Arsenal advancing into dangerous areas; although Arsenal may still dominate against weaker and less compact opposition via their individual quality and their high quality short passes, their weak layout and the instability of their connections to one another show against intense pressing teams. Another notable difference is that in these games, the offensive players – especially Mesut Özil – displayed poor performances and barely existing run routes. The reason for this is often inadequate positions and responsibilities. Mediocre flexibility and simplistic adjustments The common overload of the middle by an indenting winger and the diagonal runs of other wingers is often practiced by different types of players and against a variety of opponents. Basic tactical patterns seem to be determined by the player’s own repertoire, planned and trained away from the squad before the season starts to be accessed constantly later on. Real changes apparently only happen if Wenger has injured one of his players again, and not for tactical reasons; or because of simple strategic motives such as playing a stronger defensive player in place of a more attacking player against better teams. But major changes are quite rare compared to the likes of Mourinho, Guardiola, and Klopp. While this is an exaggeration, as Wenger does adjust some tactical stuff and varies the basic guidelines of certain strategic points (e.g. the height of the pressing), it definitely represents a problem. Get rid of the back four? One option would be to shelve the back four. The lack of proper wingers, the more centrally focused players, the wide defender types and the center backs would all profit. Mertesacker can play as a central defender with Chambers and Koscielny flanking him as halfbacks. Under certain circumstances you could even test Flamini in these positions, as well as Monreal and Gibbs. Depending on the opponent, Gibbs/Monreal and Debuchy could man the wings or even the athletic Oxlade-Chamberlain, Alexis Sanchez in a role similar to the one Arjen Robben currently plays at Bayern, Theo Walcott, Serge Gnabry, or even Lukas Podolski and Joel Campbell. It is important to get the coordination and the involvement of the players correct. Here are two possible formations. 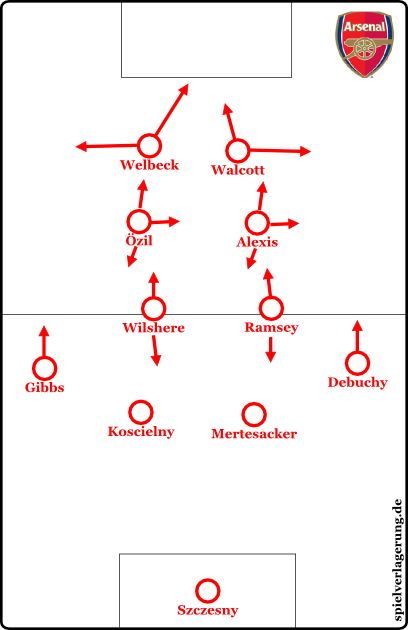 In this formation, Alexis Sanchez would start with Giroud, Walcott or Welbeck as the center forward. The choice of the three would be selected based on the opposition; Walcott goes deep with his Dynamik, Giroud opens space for the wingbacks and Sanchez and offers more presence in the air, while Welbeck functions as an additional combination player. Sanchez can fall back and support with his tremendous dribbling skills in between the lines as he does outstandingly well for Chile. Özil would then be somewhat relieved but could still play as a ten. The offensive double six of Ramsey and Wilshere would cover the back three, while the wing-backs would vary based on the opponent. Debuchy, Gnabry or Oxlade-Chamberlain are options on the right, while in most games Gibbs would play on the left. The asymmetry of the striker could also extend to the wing. Walcott could play extremely high on the right, while being covered by the right half of Ramsey and Chambers at halfback; Gibbs on the left would then play more cautiously. The same idea could be flipped with Debuchy entrusted to more defensive tasks and limiting his offensive strength. 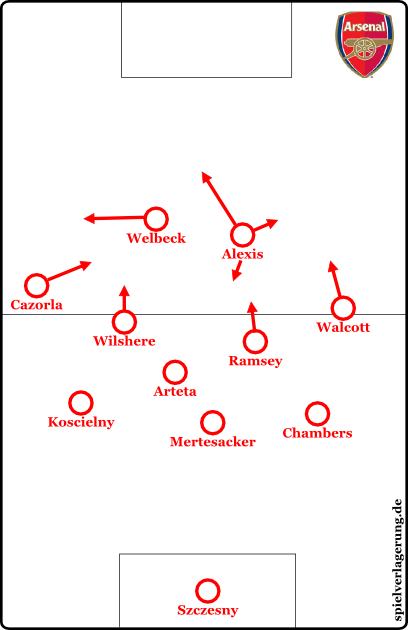 Here Arteta centrally would play at six (or Ramsey or Wilshere even drop back to bring in Cazorla as an attacking eight), but would not have to drop back as far because of the three defenders behind him. 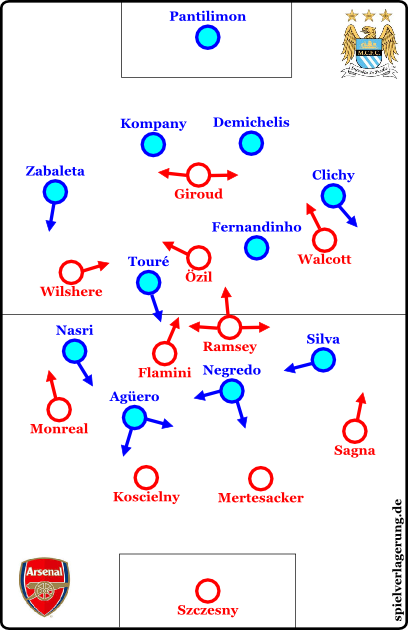 Thus, the eight would be positioned higher and Arsenal would have greater presence against the opponent’s formation. Wilshere especially would flourish here. Because Arteta can fall back between the defenders if the opponent counters, they can use extremely attacking wing-backs. A row of four with Oxlade-Chamberlain, Wilshere, Ramsey, and Walcott would be also be possible as well as Santi Cazorla as a “false wing-back” (covered by Koscielny’s excellent anticipation). Depending on the opponent, Özil or Sanchez could be the second striker; in the latter scenario, Sanchez would no longer play as the center forward but rather Welbeck or Giroud. In this scenario you would solve the lack of proper wingers by having two strikers play very wide, positioned between the full-backs and center-backs. They are tasked with occupying the opposition’s back four so that Özil, as a ten/false nine can provide an overload in midfield. Sanchez and Welbeck/Walcott are perfectly suited and dangerous with their movement behind the defense. Theoretically, even Özil could play on the left or drop out of the team. This would then provide for the alternative of Cazorla or Sanchez as ten. Welbeck and Walcott would provide the attack. Sanchez has already played this way to great success with Chile. Ramsey, Wilshere, and Ox or Arteta can play in midfield depending on the opponent; Cazorla is even an option here. This basic idea can be extended. In the 4-2-2-2/4-2-3-1 it would be possible to play Sanchez with Cazorla/Özil behind two wider strikers, with Ramsey and Wilshere supporting from behind. It’s important to have a good pressing for this; the style would be similar to Red Bull Salzburg or Bayer 04 Leverkusen under Roger Schmidt. But there is a problem: under Wenger none of this will happen. Whether it’s 4-2-2-2, 3-4-2-1 or XYZ, as long as the fundamental strategic and tactical problems are not resolved, there will be no long-term improvement at the highest level. The players, however, offer tremendous potential. How they are used is crucial. Even if this article seems very critical of Wenger, it is still a critique of him at the highest level. Wenger would be an asset for many or most of the teams in the world. He can play elegant football, has a good understanding of positional requirements, is a real football lover, displays integrity and loyalty, and knows how to keep spending within limits. Nevertheless, certain aspects must be critiqued; particularly the pressing and the buildup structures. The latter is almost paradoxical, because their position play and their basic playing techniques are worthy of all the honors of short passing football. Yet, it happens too often, that Arsenal are either isolated from the opposing formation or there is no connection between the middle of the pitch and the final third or the penalty area. Should this be corrected and the defensive stability when pressing as well as in transition improves, then Arsenal could be serious competition for City; but Chelsea seems unattainable. In Europe, their opportunities would be greater, but that currently depends on the teams they face. The decisive factor, though, is injuries. The causes here are deep and the coaching staff does not seem to be aware of them. Despite a widely announced closer analysis of the problem, the defects were attributed to external factors or “bad luck”; this doesn’t seem to augur short-term improvement. Without the ability to make full use of the squad, many good tactical ideas are obsolete. Thanks to the quality, the positives of the basic philosophy and a few other smaller aspects Arsenal is still a really good team in the EPL and will probably somehow finish again in the Top4; yet they have massive problems in Europe and against top teams and it doesn’t look like it will change. If you are interested in match analysis of Arsenal – since 2011 we have analyzed more than 40 games of Wenger’s Arsenal publicly on Spielverlagerung.de by various authors. This text was first published in German as series on Abseits.at. Abseits.at’s a great site in general and I write regularly there. You can find my articles under this link. It was translated by @rafamufc – as usual. Big thanks to him! Edit: Although my source said otherwise Wenger did not hire a coach from US sports, but one expert for general fitness of the German national team. Still, the basic point about non-footballspecific applies to Wenger himself, although in this regard the argument itself was not correct. I totally agree with newfootrepublic. 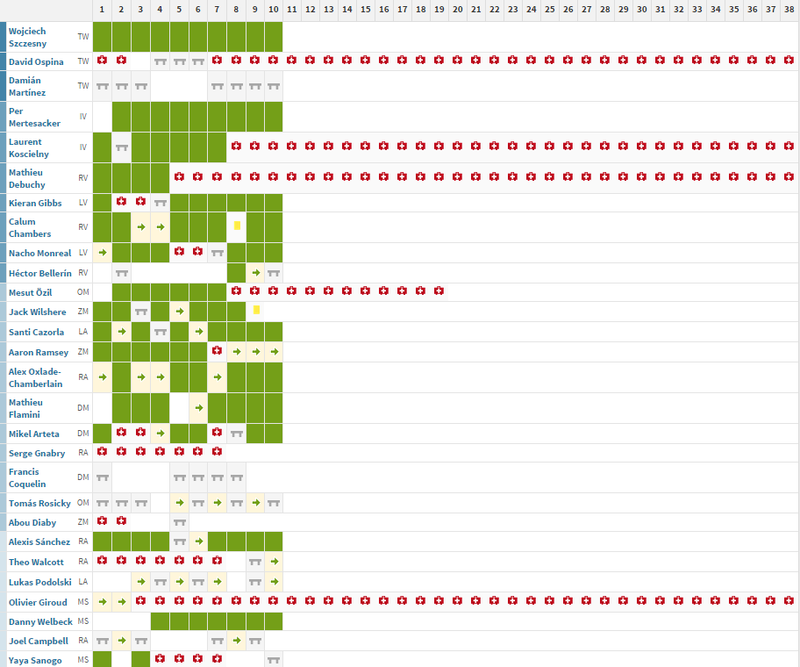 Very good and analytic work. I have also some difficulties with German tactical terms but overall great work. I would expect a similar article regarding Man U and Liverpool who face long-term problems. I love the detailed analysis and honesty u put into this. Ur both spot on and fair in ur views on the team and Wenger, plus u also made informed suggestions. Thanks for filling the Zonal Marking shaped hole in my heart. As much as I enjoy the site I wish you guys would add a glossary especially since you seem to use german tactical terms that are translated into English. A very thorough analysis of what could be AFC and Wenger’s potential issues. It seems very easy to blame what ails AFC on Wenger but that is far too simplistic. Having such serious injury problems since 2005 is crippling and the debt as well but the really insidious effect that poor and biased officiating has had is also very evident. There are two great websites that have analyzed the impact such corrupt officiating has had, not just on Arsenal but on other EPL and European teams as well. Wenger has NOT been a failure by any measure….3 league titles and 5 FA cups, plus the charity shield at the start of this season is no mean feat. He has kept Arsenal in the top 4 and in the CL for 18 years straight….NO other manager has done that. Do you ever feel you have a little too much time on your hands ? Frage auf deutsch, wegen des interessanten Artikels: Kannst du erklären, warum so ziemlich jeder Transfer von Arsenal zu Barca (von Overmars und Petit, über Hleb, Henry und Fabregas bis zu Song) floppte oder zumindest nicht die Erwartungen erfüllte, außer van Bronckhorst, der ausgerechnet bei Arsenal weit davon entfernt war Stammspieler zu sein?